Planetary Secrets has given his debut on our Etui Winter Camp 3 compilation with his fantastic tracks They Have Been Here and Courtyard. The Dresden newcomer started his journey into sound in 2013. 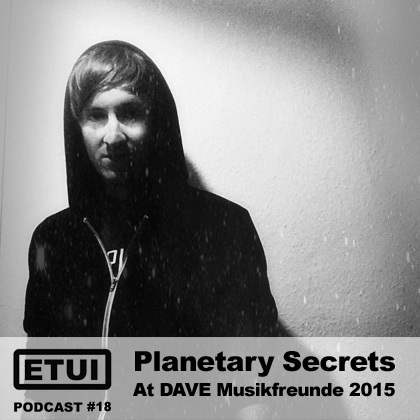 For our Etui Podcast series he shares the dj set he played as this year’s DAVE presents Musikfreunde event in May. How did you come in contact with house and techno? I first came in contact with it in the mid/late 90’s through my sister and cousins who were listening to it. I started to collect CD’s from the local library and recorded them and some radio shows on tape. I also shared and exchanged those tapes with friends. To sum it up, I started at a very young age. Then, somewhere in the early 2000’s I dropped electronic music completely and listened to guitar-based music like punk rock. Eventually, in the late 2000’s, I came in contact with drum’n’bass and when I moved to Dresden in 2009, with techno again as well. I don’t know if I really have a consistent style. Right now I skip between nearly every subgenre of electronic music. But there are probably some recognizable elements which I use in most every track, like the chord stabs, pad sounds and sampled field recordings/noise/crackle/voices. Also, reverb, delay and distortion are important elements and my sound is fairly dubby and spacey, I would say. You will probably not hear happy music from me either, but I’m trying out new things with each new track. In They Have Been Here you are using some vocal samples from a movie. From what do you draw your inspirations? Very different sources, mostly combined. Darkness and the night is a big factor in my music. The atmosphere, ambiance and music of “The X-Files” and “Twin Peaks” really got me. I watched X-Files as a child and the dark, 90’s style of the early episodes and Mark Snow’s Synclavier music inspired me very much. I’m still watching an episode now and then. I’m also interested in astronomy. 90’s video games from my childhood and their music/atmospheres are an inspiration as well as urban stuff, big cities, experiences in nature and with other people – love, sadness, the usual stuff. Of course, other people’s music too, like early dub-techno (Basic Channel, Chain Reaction), different breakbeat stuff (Alix Perez – especially the 1984 album, dark minimal d’n’b, early d’n’b, Burial …) and current trends. Not to forget my punk rock days, which taught me to keep things raw and uncommon. What have dub techno and drum & bass in common for you? D’n’b is a wide genre, I would say both focused on bass and a dark atmosphere in their early stages. Some D’n’B subgenres have the same focus on hypnotic atmospheres and are also not dancefloor focused, but this isn’t true for every dub techno track either. Which gear do you use for producing? I have some outboard gear which I use nearly every time. My lovely little Yamaha FB01 is a pain to program but in my opinion it sounds more exciting than most software FM-synths. The Waldorf Rocket is more for the solid stuff like basses and the Waldorf 2-pole is for filtering and “warming” my software synths. I have a bunch of different software plugins, some I use nearly every time like U-he Satin or Klanghelm SDRR and others for one track and never again. I also sample a lot of stuff. If I want to go lo-fi, I send the sound through my guitar amp or record it on an old cassette deck and put it back into Ableton Live. Honestly I think it’s about how you use your tools and not the tool itself. I don’t buy stuff only because of attributes like “analog”, if it sounds good and I can use it practically, it’s good. I want fun while producing but also a finished track in the end, in which I can find myself. I have 3 upcoming d’n’b-releases, the biggest one is probably the one on Ingredients Records in the beginning of 2016, a label where many great producers (like Skeptical, who is at Sabotage Dresden at the end of August!) have left their footprints. The other 2 are Offworld (Liquid D’n’b) and Visceral Vibrations (more experimental and dubby halfstep). Techno wise, I have a track on the next Echogarden Compilation and there is a Remix for Santinelas “Between Reflections” coming out soon on Edaphon Netlabel. There are some other releases in the process of planning, but I wait till everything is safe. Your gig at DAVE pres. Musikfreunde was your first big DJ gig. How do you felt about it? Do you was nervous? The last hours before the gig I was nervous, you never know what will happen when you rely on technology. As soon as I started I felt better. I had the first slot on the big floor and I knew there wouldn’t be a lot of people, so I didn’t feel a huge amount of pressure on me. It was fun. The people gave me good feedback and it was a good opportunity to gain some experience. What is the idea behind your mix? I like to combine different genres and tried that in this set. It is difficult to make several genre jumps without losing the flow of the set, I have to work on this, the right amount of changes and mixing speed. But overall I think the set was fine.